The Lazer Z mows up to 8.4 acres per hour at ground speeds up to 11.5 mph. The full-floating UltraCut Series 6 deck features a heavy-duty Triton spindle. The Interrogator one-box digital video recording system allows law enforcement personnel to accurately record the proceedings inside interrogation rooms. Government spending continues to shore up the economy, with $38 billion potentially on tap through jobs bill. 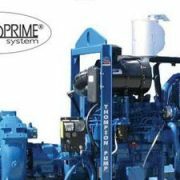 The JSC Series solids handling Enviroprime portable pumps range in size from 3 to 18 inches, are designed for high flows to 11,000 gallons per minute and heads to 330 feet, and are diesel- or electric-driven.